So, as it was a wet, horrible day here in England, and with tyring to sort through to find come cable colours to wire in my crossover circuits I've built, I figured I'd put it all in one spreadsheet..
And after a few hours work, looking in the ETM again, and collating my pages of notes, I have attached the PDF file to this post. I know there were a couple of threads where people were asking what connector did what, where it went, how it was wired etc - so instead of posting this in numerous threads, I figured it was easier to start this. Anyway, I hope this is useful, or informative to some... If you find any errors or omissions, then don't hesitate to let me know, and I'll amend the document - I've tried to get complete accuracy, but there were a couple of bits in the ETM where there was no information (CD changer was a bit sketchy) so have tried as best as I can to search the web for correct info.. Please note also... this is ONLY for the models with the single DSP amplifier in the boot (1999MY On), NOT earlier models with the individual door amps (up to 1999MY). Let me know if it's any use! The possibilities are almost endless... it's more the implementation which is a pain, largely due to lack of technical info..
Ideas/Thoughts welcome - but whatever I end up doing - I'll post up any other technical info I find that may be useful to others! great info Marty, i lost the other thread but did find out why the speaker didn't work with the amp? could you give it another preamp source so the telemute is out of the loop? defo get an oscilloscope if you can, my clarion sadly demised long before i had the chance to get a signal from it. Don't have any form of telemute at the moment in the vehicle, was just another theory of making things work! I'll figure it all out one day! i was thinking the mp3 as the [preamp] source into your amp and onto the speaker your choosing, leaving the nav unit (and any telemute) out of it. there is a test with a AA battery primarily to check the phase, but it's as good to see the cone working or the wiring is good. I may have misunderstood where your talking about speaker's in the car or via bench testing, apologies if thats the case. No worries... My setup is a little different to your understanding - probably because my explanation was more of how the thoughts came out of my head! The setup was an amplifier module I bought (a Kemo Electronics 12W universal one) with an input from my mp3 player as a source (on the workbench for testing) and an 8ohm speaker that I found under the drivers side trim, from a Nokia car kit, connected to the amplifier output. I then transferred the circuit to the car, and connected the Nav system to the input (instead of mp3 player) and tried to see if I got any audio output. Nada... nothing.. zip.. I got some noises, and they changed when I adjusted the volume, but not the spoken words like the nav system is supposed to have. As an update from this afternoon... I pulled the Nav Computer from the car, put it on the workbench and pulled it to bits. I figured I'd try and trace the audio output pins back to whatever drove them, and then see if I could find any info from there. With a bit of blind luck (tracing the pins was a complete bugger as the board is multi-layered - with probably at least 1, maybe 2 internal tracks sandwiched) I found a chip that seemed to link to the pins, and did a google search for the chip. So.. the next step (when it's not raining again) is to connect the nav system wires to one of the sets of spare lines I ran when the carpet was up, and will re-mount the speaker under the drivers trim, and I should have Nav with audio !!! independant of the stereo, so it'll talk to me over the music. My head unit does have a mute line in, so if I find it is too hard to hear, then I'll connect the Nav Mute to the head unit, then it'll mute the stereo when the sat nav talks. Great info/details, Marty - and very useful..
how Rave should be !! Wow... thanks for the info! This will come helpful when I decide to upgrade (so far I have been reluctant to mess with it!). 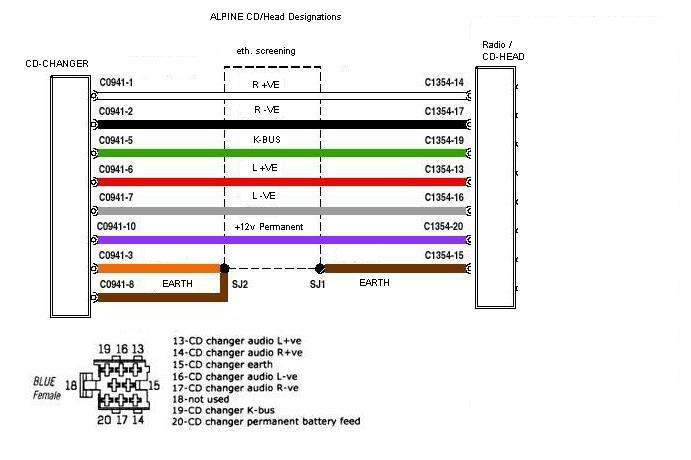 Has updated info on the CD changer wiring. Yes, I do have the wiring harness still there, and from memory the wiring does match - but will double check tomorrow if i get the chance.. It was more a request for the actual cable functions, since the info I got from wkipedia regarding the pinouts appears to be backwards, and the wiring colours probably differ in different vehicles, even though the pin configs are probably the same! Maybe asking if anyone had tested the pin functions would have been better! The Nav unit in mine was the original Carin etc etc. but instead of bewing "built in", the display had been installed on a bracket in front of the cubby space below the central heater vents... It shook a lot at 100kmh!! In the end I removed the whole thing. Then I discovered that it had also been linked to a reversing sensor on the passenger side...but had never operated as best I know. Your diagram however has resolved a lingering "what if"... The reason for removing the complete works was that the price being demanded here for an updated map CD to drive the Nav however was double that for a complete navigator with updated maps and superior sat tracking!!! New fuel pump with no connections??? Advice about CD changer connections please! !